PHILADELPHIA — During his final remarks at the Festival of Families in Philadelphia, the Roman Catholic pontiff Jorge Bergoglio, known as “Pope Francis,” led the thousands in attendance in a prayer to Mary and Joseph out of his belief that the former earthly parents of Christ serve as protectors of families in the present. “Before the final blessing, let’s pray a prayer to Mary and also an invocation to Saint Joseph, so that they can protect our families and they can help us to believe that it’s worth the struggle and the fight for the good of the family,” he said at the conclusion of the event, which included song and dance from various musical celebrities, as well as speeches from Catholic families from around the world. 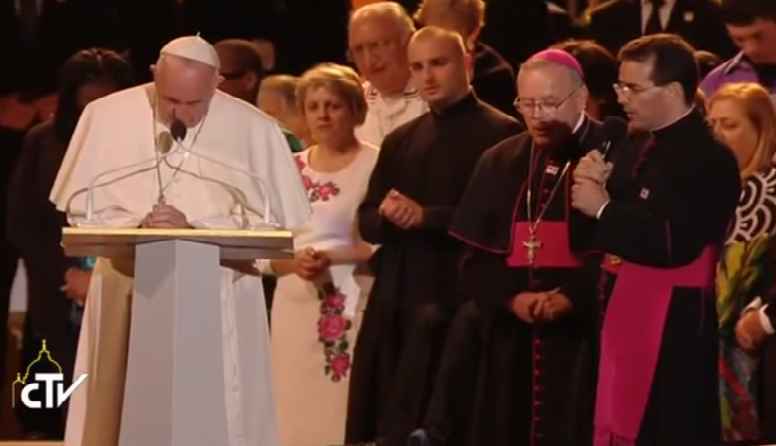 Francis then led the crowd in the “Hail Mary,” who recited the common prayer with him. The Roman Catholic leader immediately followed the prayer with an invocation to Joseph. But Mike Gendron of Proclaiming the Gospel Ministries in Plano, Texas, a former Roman Catholic who now leads an evangelistic ministry to reach Catholics, told Christian News Network that the practice of praying to any deceased person is unbiblical. “The pope would do well to study the truth of God’s word so that he will stop deceiving people. For him to ask people to pray to Mary and Joseph, who are physically dead, is an abomination to the Lord,” he said, pointing to Deuteronomy 18:11-12, which forbids communicating with the dead. Gendron outlined that it is furthermore not necessary to ask any deceased person to pray for them when the Scriptures outline that men must pray to the Father in the name of Jesus. “Paul also made it clear how to pray when he wrote to the Church. He said, “[B]y prayer and supplication with thanksgiving let your requests be made known to God,” Gendron continued, pointing to Philippians 4:6. He said that he hopes the pontiff will place truth over tradition. “Francis would do well to heed the warning of Peter, whom he thinks was the first pope. Peter said, the Lord is against those who do evil—which would include consulting the dead—but His ears are open to the prayers of the righteous,” Gendron stated.